Track, prioritize, and solve customer tickets. Organize your tickets the way you want with the amazing kanban view. Get an instant overview of your team's workload and check the status of a ticket based on your custom tailored SLA rules. Get in touch with your customers where they are. New incoming emails create tickets automatically. Qualify your customers queries with a customizable website form. Listen to Twitter hashtags and create tickets on the fly if needed. Use the Live Chat plugin on your website to instantly engage visitors. SLAs, Automation, Templates, and Canned Responses. 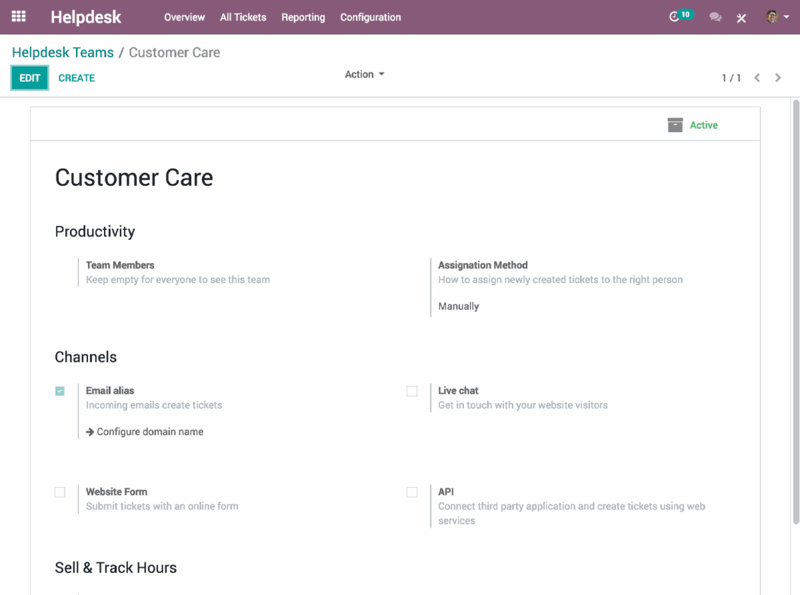 Create your SLA rules and let Odoo take action automatically. Automate emails or actions at different stages of ticket resolution. Define dynamic email templates to automate the most common responses. Escalate tickets to your manager in just a click. Invite experts into a live discussion. Use canned responses in live chat for instant answers. Sell, renew, and upsell easily. Sell support contracts to automatically provide helpdesk services to your customer. Track time on each contract with the timesheet app, and upsell automatically with time-limited contracts. Create alerts for your sales or helpdesk team based on your customer status. Develop your self-service platform by directly linking your FAQ, training videos, and presentations on a ticket. Develop a community around your product with the forum.